As many of you can attest, there’s no shortage of peanut butter here at BoB. But, one thing I’ve somehow never done is make my own peanut butter. Recently, however, I received one very good reason to change that: a Vitamix. I decided to go one step further and make a mixed nut butter using peanuts, pecans, and cashews. My Vitamix made it so simple! I tend to like things the way I like them, and I love getting to customize the nut butter with different nuts. 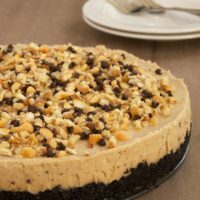 I used my homemade nut butter as inspiration for a cheesecake. And, I really couldn’t be happier with the result. There are so many reasons to love this cheesecake. The flavor is wonderful. The texture is so smooth and creamy. And, maybe best of all, it’s so simple to make. Including my wonderful homemade nut butter, I used my new Vitamix three separate times to make this cheesecake. I made both cookie crumbs for the crust and whipped cream for the filling in mere seconds. The best part might be how simple it is to clean. Some water and a little soap, and this thing cleans itself. How great is that? I must confess that when the lovely folks at Vitamix offered to send me one of their beauties to try, I was excited but not overly so. I’ve had blenders before, so I thought I knew what to expect. But, this is not your ordinary blender. We very quickly became enamored with it. In the last few weeks, we’ve made everything from soups to smoothies to hot chocolate! And, I’m so excited to be able to give one of you your very own Vitamix! Scroll past the recipe for all the details. 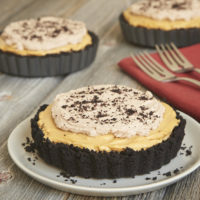 Nut butter, chocolate, and cream cheese are the perfect dessert combination in this Nut Butter No-Bake Cheesecake! Place about 1/4 of the cookies in the Vitamix container and secure the lid. Select Variable 1 and slowly increase to Variable 4 or 5 until cookies are ground. Transfer crumbs to a medium bowl. Repeat with batches of remaining cookies. Combine the cookie crumbs, butter, and sugar. Press the mixture into the bottom of a 9-inch round springform pan. Place in the refrigerator. Place the peanuts, pecans, and cashews in the Vitamix container. Blend for 1 minute, using the tamper to press the ingredients down toward the blades, or until desired consistency. Place the cream cheese, measured nut butter, brown sugar, sugar, and vanilla in a large bowl. Using an electric mixer on medium speed, beat until well-blended and smooth. Place the cream in the Vitamix container and secure the lid. Select Variable 1. Slowly increase to Variable 10 and then to High. Blend for 12 seconds. Gently fold the whipped cream into the filling mixture. Transfer the filling to the prepared crust. Smooth evenly. Refrigerate for at least 4 hours. Combine the nuts and chocolate chips in a small bowl. Sprinkle over the top of the cheesecake. Run a knife around the inside of the pan before removing the sides of the pan. **If using unsalted nuts, you may want to add salt to taste. The Mixed Nut Butter recipe will yield about 1 & 3/4 cups of nut butter. Store remainder in an airtight container. ***Take it slowly with the nut butter. If the pitch suddenly changes, it’s possible that some air has become trapped under the mixture. Use the tamper to get things mixing again or turn off the blender and start back at Variable 1 and slowly increase. Mixed Nut Butter recipe and whipped cream method adapted from Vitamix. Vitamix is giving one very lucky Bake or Break reader a Vitamix 5200! I’m absolutely thrilled to be able to offer this giveaway! 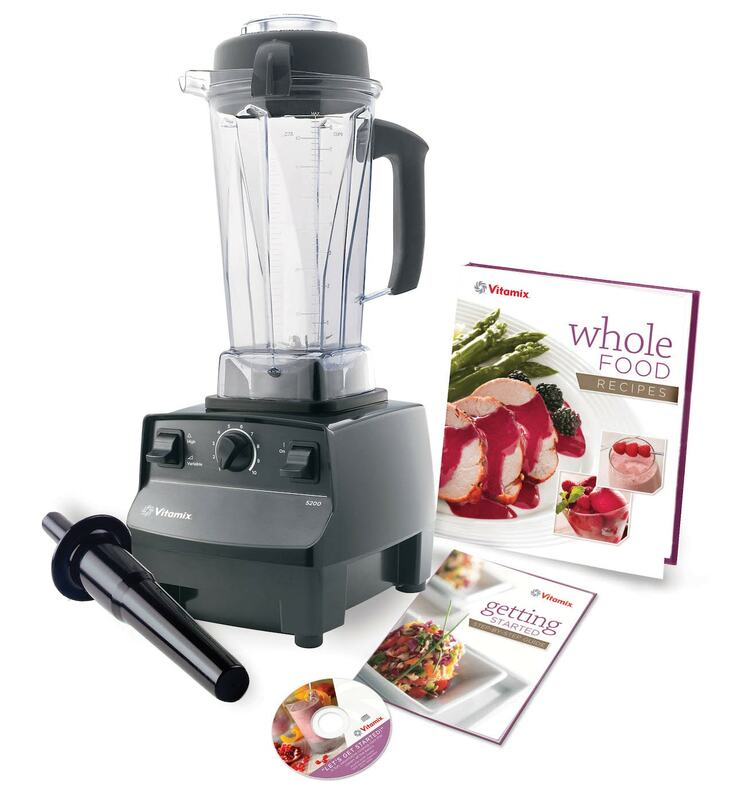 Disclosure: Vitamix provided me with a blender and is providing the product for the giveaway. All opinions are my own. The cheesecake looks amazing. 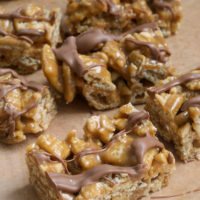 I can’t believe it is no-bake. Love it. Pinned!! Oh my goodness this looks wonderful. Pretty impressive that your making your own nut butter. Thanks for sharing. I’d love to try some homemade nut butters!! I would love to make hot soups,nut butters,ice cream and everything else imaginable! Oh wow you made a mixed nut butter, I love it! And then used it in this cheesecake, Which I am even more in love with. For starters, I’d make this cheesecake with a new Vitamix! Holy Cow. This is amazing! I love my Vitamix. 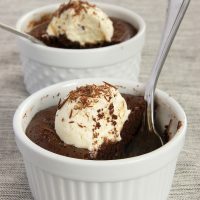 Thanks so much for giving me a decadent recipe to use it for! My husband and son don’t love peanuts so I’ll just use other nuts and customize my own nut butter as well. Wow! 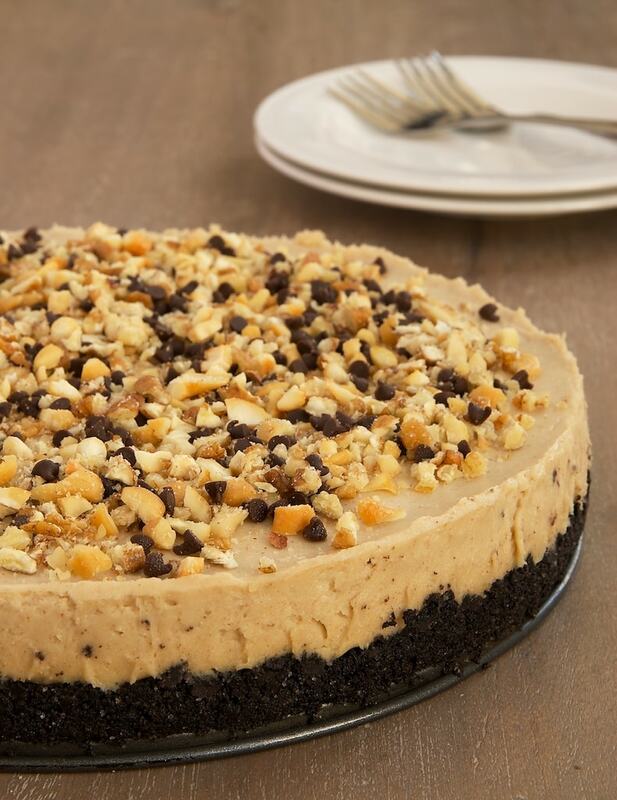 I love, love, love cheesecake…Just might need to make this one and add some “spirits”. Thank you! I didn’t even know you could make nut butters in a vitamix…now I really want one! I would use it to make smoothies, juices and primarily, for soups that I love to make 3-4 days per week. This would work wonders for me. Can’t wait to try this cheesecake sounds delightful! Great giveaway, and beautiful cheesecake! I recently made my own PB for the first time too, it was so yummy! I wish I had a vitamix though! Love the idea of mixed nut butter, so yummy! I am SO dying for a vitamix!! I have wanted one for ages…and even more so now that I’ve seen this cheesecake! I receive your recipe updates via email, however, I didn’t see any place to sign up for a newsletter. Are they the same? I hope you can include me in the giveaway. Those rafficopters things sign me up for so much spam mail, that I wanted to do it here, If not no worries. Would LOVE a Vitamix. The money I spend on those Blue Print juices kills my wallet! Juicing is such a great way to exceptional health. Oh my gosh this looks soooooo good. Im celiac but I love good recipes!!! 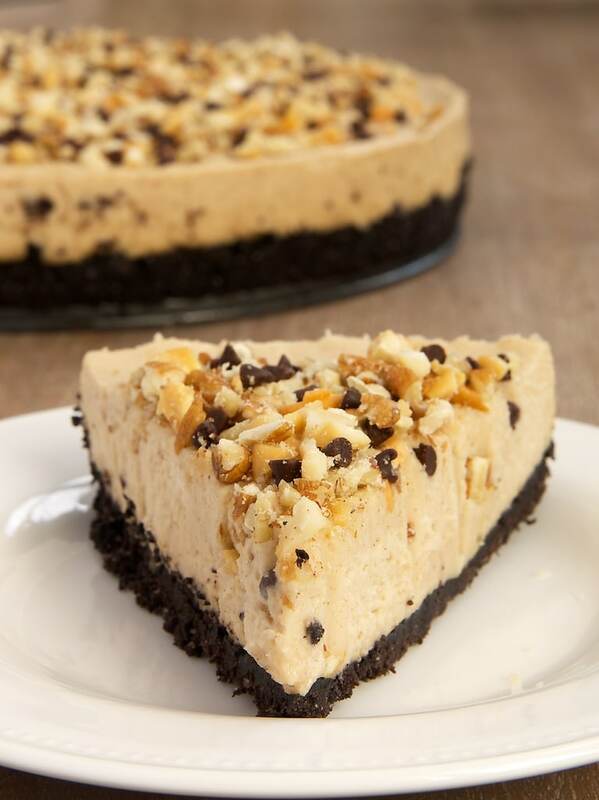 Ill have to make this with a gluten free crust, cheesecake is one of my favorites! thanks for the recipe, and the opportunity to win a Vitamix! I really want to attempt to make this.Unfortunately, it is difficult to find Nabisco famous chocolate wafers in my country. Can you pls suggest a good substitute? Thank you. Hi, Linda. I’ve used other simple chocolate cookies when I’ve not been able to find the Nabisco wafers. Oreos, with or without the filling, would also work. 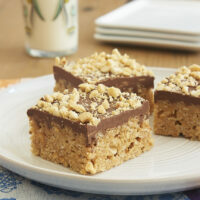 Or, chocolate graham crackers would be a good substitute. i would love this and the mixer would be a great win…Cheese cake yum. 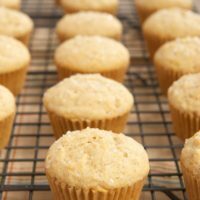 Can you recommend a Vitamix container, I would like to purchase one for mainly dry ingredients, like making your yummy cookies! and while you’re at it, one for liquid… for example protein shakes, smoothies! I went to Vitamix’s website and was a little overwhelmed. Hi, Joyce. I have a 62-ounce container and a 32-ounce dry container. i love my Vitamix!! This recipe looks fabulous. Cant wait to give it a try. Your recipe looks delicious! I love all kinds of nuts and would love a Vitamix blender. Since I’m the only one in the house who lives cheesecake. 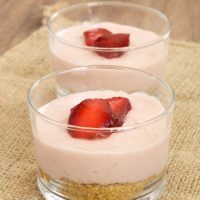 I’ll make these as individual sized cheesecakes and freeze them to enjoy one at a time!